Fine appearance, dark ruby, big head to a start. Has some good burnt malt, sweetness in aroma. Taste ends bitter. A good schwarzbier. Quite malty and sweet. It has the proporties of a real schwarz; mild and sweet and easy to drink. Brown coloured. Very malty. Slightly roasty with a mild and sweet finish. A good ordinary Schwarzbier. dark amber. typically bland but well-made. burnt brown sugar. hard to think of much to say. sorry. Dark ruby red. Creamy and lasting head. Dark malt aroma. Pretty strong flavour of roasted malt which continues until the aftertaste. Finishes lightly hopbitter. Aftertaste lasting but not really nasty. Nevertheless quite thin body. To sweet for a Schwarzbier. but some like it sweet. Beautiful dark colour and a wonderful, lightly sweet aroma. Flavour is dominated by malts and some sweetness too (licorice?). Lightly bitter and extremely pleasant finish. Dark (Duh) foamy white head. 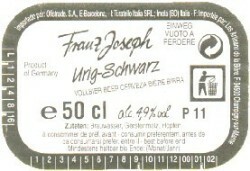 An initial malt taste with a hop follow and a lingering bitter aftertaste. Slightly metalic taste is a put off. A watery texture. Not one I will try again.